Brine contamination of groundwater in the East Poplar oil field was first documented in the mid-1980s by the U.S. Geological Survey by using hydrochemistry, with an emphasis on chloride (Cl) and total dissolved solids concentrations. Supply wells for the City of Poplar are located downgradient from the oil field, are completed in the same shallow aquifers that are documented as contaminated, and therefore are potentially at risk of being contaminated. In cooperation with the Office of Environmental Protection of the Fort Peck Tribes, groundwater samples were collected in 2009 and 2010 from supply wells, monitor wells, and the Poplar River for analyses of major and trace elements, including strontium (Sr) concentrations and isotopic compositions. The ratio of strontium-87 to strontium-86 (87Sr/86Sr) is used extensively as a natural tracer in groundwater to detect mixing among waters from different sources and to study the effects of water/rock interaction. On a plot of the reciprocal strontium concentration against the 87Sr/86Sr ratio, mixtures of two end members will produce a linear array. Using this plotting method, data for samples from most of the wells, including the City of Poplar wells, define an array with reciprocal strontium values ranging from 0.08 to 4.15 and 87Sr/86Sr ratios ranging from 0.70811 to 0.70828. This array is composed of a brine end member with an average 87Sr/86Sr of 0.70822, strontium concentrations in excess of 12.5 milligrams per liter (mg/L), and chloride concentrations exceeding 8,000 mg/L mixing with uncontaminated water similar to that in USGS06-08 with 18.0 mg/L chloride, 0.24 mg/L strontium, and a 87Sr/86Sr ratio of 0.70811. The position of samples from the City of Poplar public-water supply wells within this array indicates that brine contamination has reached all three wells. Outliers from this array are EPU-4G (groundwater from the Cretaceous Judith River Formation), brine samples from disposal wells (Huber 5-D and EPU 1-D), USGS92-11 (a well with water that was considerably contaminated in 1992 and becoming less saline with time), and PNR-27 (only slightly below the defined trend with an 87Sr/86Sr ratio of 0.70793). Water samples from the City of Poplar wells are also enriched in anions and cations that are abundant in oil-field brine. 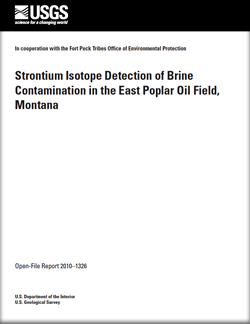 Peterman, Z.E., Thamke, J.N., Futa, Kiyoto, and Oliver, T.A., 2010, Strontium isotope detection of brine contamination in the East Poplar oil field, Montana: U.S. Geological Survey Open-File Report 2010–1326, 20 p.